George Frideric Handel (1685-1759) was born in Germany but is widely regarded as the most celebrated “English” composer since Purcell. His father wanted him to pursue a career in law, but he showed musical aptitude on the organ from an early age. Inspired by watching opera performances, he started composing operas himself. Then in 1706, he traveled to Italy and became familiar with the regional musical style. He also started composing oratorios, which could be performed while people gave up opera for Lent. 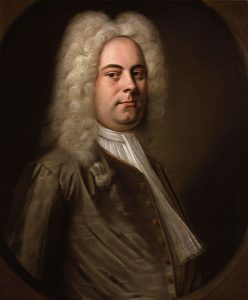 Handel traveled to London, where Italian opera had become all the rage and started composing Italian operas to be performed there. He also started writing English oratorios, which were extremely well received. Hicks, Anthony. 2001 “Handel [Händel, Hendel], George Frideric.” Grove Music Online. 17 Sep. 2018.